Special education is defined as a learning experience geared towards students with disabilities, such as physical impairments like blindness or deafness, learning difficulties, problem behavior, emotional difficulties, and multiple disabilities. In this context, education refers to methods of instruction, related curriculum materials, and teachers, including those with special education degrees. Special education is not only a classroom experience, but also includes services in resource rooms, other kinds of classes, and experiences outside of schools. Special education has a legal definition in the United States under the federal Individuals with Disabilities Education Act (IDEA), which was first passed in the 1980s and most recently reauthorized in 2004. Special education is a relatively new educational concept. While the federal government mandated the creation of special schools for the deaf, blind, and mentally ill in the nineteenth century, people with disabilities were generally not in the public eye, except for disabled veterans returning from World War I and World War II. Until the mid-twentieth century in the United States, many people with disabilities were not allowed to be part of mainstream society and were hidden away in institutions. Individuals with disabilities were often considered uneducable, if not a burden. This situation took many years to change, though by the early twentieth century, a few classrooms were opened to students with disabilities because of parental efforts. The landmark court case Brown v. Board of Education in the 1950s not only changed educational opportunities for African-American students for the better, but for all students, including those with disabilities. Special education degrees became vital in the early 1970s after important court cases led to changes in educational policy for students with disabilities, including Pennsylvania Association for Retarded Citizens (PARC) v. Commonwealth of Pennsylvania. With the positive ruling in this case, mentally challenged individuals were given the right to a free public education between the ages of six and twenty-one. The programs for these students had to be comparable to programs offered to those without disabilities. Financing for special education programs came in 1975 with the Education of All Handicapped Children Action bill. As these legal changes were made, individuals with disabilities became more visible instead of isolated and excluded. Teachers with special education degrees began helping their students to receive an education, graduate from high school, then receive vocational training or enter college and find employment. The 1980s saw continued changes in support for all people with disabilities, through the first passing of IDEA as well as the American with Disabilities Act. More support was given to the disabled community as a whole, including special education students. In 1997 and 2004, IDEA was re-authorized and made many positive changes to special education. Among the most prominent change was the mandate to include special education students in general education classrooms instead of separate classrooms. This philosophical belief is known as least restrictive environment or LRE. That is, special education students should be educated in the least restrictive educational environment possible. Teachers with special education degrees then began entering general education classes to work with general education teachers to ensure that the needs of special education students were met in general education classrooms. Under the 2004 law, special education students were not only put in general education classrooms whenever possible, but also expected to access content from the general education curriculum to empower them through raised expectations. However, some students with severe or profound disabilities cannot fit in general education classrooms, and IDEA requires such students receive their education in an appropriate environment where individual supports can be provided. There are a number of requirements for aspiring special education teachers. These requirements vary from state to state. Most people who become special education teachers earn an undergraduate degree (often a special education degree, though this is not always the case), complete an approved training program in special education, and become certified. All teachers, whether leading a special education classroom or a general education classroom, must be certified in every state in the United States. 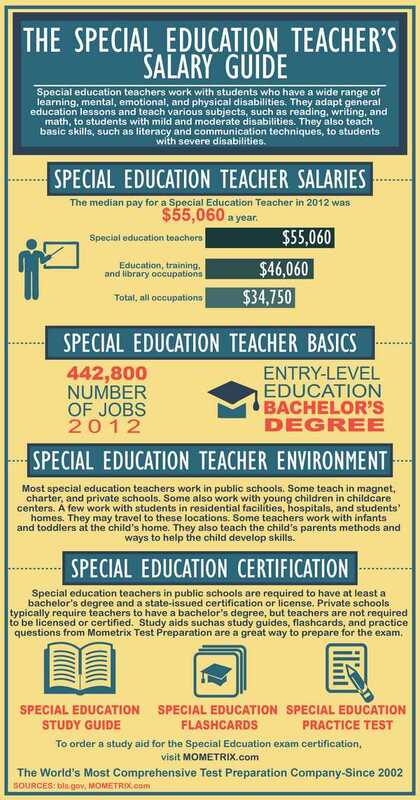 Some states require that special education teachers earn a master's degree as well. Those people considering earning a special education degree can study the subject at many colleges and universities in the United States. Special education programs are available not only for undergraduate and master's degree students, but for those pursuing doctoral degrees as well. 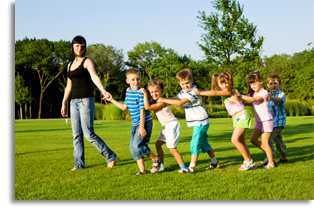 In special education undergraduate degree programs, students generally take courses both in general education and special education. However, becoming a special education teacher can mean more training than what a general education teacher generally receives. More schools have begun requiring a fifth year of study after the four years an undergraduate degree typically takes. The nature of the special education degree also varies among colleges and universities. While some institutions focus on generalized special education degrees, other special education programs have students specialize in a certain area of special education. As part of the undergraduate degree, students complete a year of student teaching at the end of their degree program. This involves working in a classroom with one or more certified special education teachers. Teaching in a classroom gives the student much needed experience in real-world teaching situations. Completing a master's degree in special education involves at least one more year of coursework. Many master's degree programs in special education are focused on a specialty within special education. A doctoral degree—obtained by special education teachers who not only work in the classroom but also conduct research and educate other special education teachers—requires a specialization as well. After obtaining the needed degree or degrees, aspiring special education teachers must pass a licensing test and an assessment or certification test to be fully accredited in most states. Such tests measure the knowledge and aptitude of those who want to become a special education teacher. There is also categorical licensure, in which teachers are certified to teach only certain kinds of special education students. In California, for example, there are a number of requirements to obtain the Preliminary Education Specialist Instruction Credential. They include a bachelor's degree or higher as well as an Education Specialist Instruction Credential program approved by the California Commission on Teaching Credentialing. Most new aspiring special education teachers also must pass the Reading Instruction Competence Assessment and demonstrate subject matter competency. Because of the vast unmet need for special education teachers, many states have developed alternative ways of gaining a teacher's license to teach in special education as well as general education classrooms. Known as alternative training programs or alternative licensure programs, they still require a bachelor's degree of some kind. Most of these programs first give students training and supervised preparation. After passing a teacher certification assesment test (which you can read about here), alternatively licensed teachers teach with supervision for a period of one to two years. The demand for special education teachers has compelled some states to offer conditional licenses to teachers with a general education background. Special education teachers who move to a new state also face challenges. Some states have arranged for reciprocity agreements so that special education teachers can transfer their teaching license between states. Others, however, ask that special education teachers meet that state's licensing requirements, including potentially completing additional coursework, taking training programs, and/or passing that state's licensing tests.